Keep your garden looking beautiful with these strong, lightweight, and ultra-sharp pruners. Not only are these garden scissors absolutely comfortable, but their smooth slicing motions will keep you clipping and snipping for hours. You can use them for accurate deadheading of flowers as well as trimming pesky stems and branches. Rust resistant. Titanium coated blades are corrosion-free. Easy to clean. Sap groove indented on the lower blade means fast cleaning. Safety first. Safety lock minimizes accidents and increases your blade's life. Lightweight design. Drop forged aluminum body makes them lightweight but sturdy. Comfortable grip. Ergonomic, shock absorbing handles ensure you won't ever suffer from hand fatigue. How do you maintain your garden snips? Easy! Step 1: Lovingly prune your garden. Step 2: Wipe with clippers with a well-oiled cloth. Step 3: Store clippers in a dry place and admire your garden! Upgrade your gardening tools and add these amazing Green Heart Pruning Shears. Click Add to Cart NOW! PRUNING SCISSORS FOR FLOWER BOUQUETS: Expanding your gardening arsenal? This sturdy yard tool with ultra-sharp titanium blades and a safety lock (stay safe!) provide maximum cutting power to boost your yard. You're looking at the 8 inch (20cm) Green Heart Titanium-Coated Secateurs in a 5 pack. 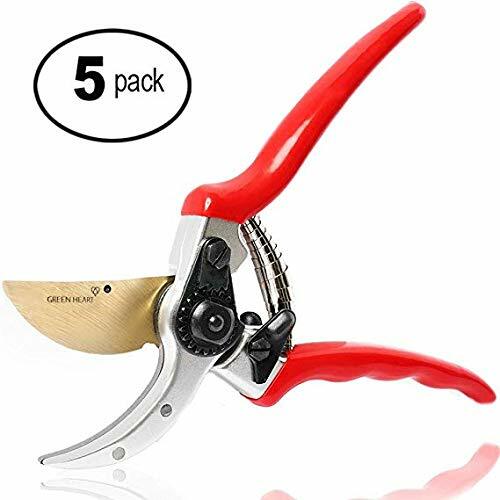 ALL PURPOSE PRUNING SHEARS: These sturdy cutters are precise for accurate deadheading of flowers as well as trimming pesky branches. Designed to shape everything from vegetable plants to fruit trees, and annuals to perennials, you can use it everywhere. EASY AND COMFORTABLE-GUARANTEED: Ergonomically designed, shock-absorbing handles make this the most comfortable pair of clipper. If You Don't Love This Product You'll Get Your Money Back-No Risk, No Hassle. STURDY AND RELIABLE BLADES: Titanium coated blades make these pruners rust-resistant, they will last a lifetime. Plus, the indented sap groove makes it easy to clean so you can tend to your garden, not your pruner. LEGENDARY BYPASS DESIGN: Sharp, curved blades in a scissor-like design consistently deliver clean cuts without effort. Its versatility makes it a great gift for florists, indoor gardening and bonsai enthusiasts, and a perfect addition to your home. If you have any questions about this product by Green Heart, contact us by completing and submitting the form below. If you are looking for a specif part number, please include it with your message.